*This offer runs from 16th to 23rd October and is valid for every LEGO® Technic purchase online at shop.LEGO.com, in LEGO Stores and LEGO Catalogue telephone orders. The voucher is valid on LEGO Technic orders of £99.99 and above, online at shop.LEGO.com, in LEGO Stores and LEGO Catalogue telephone orders from 23rd October to 23rd December 2017. The original qualifying voucher must be supplied to redeem – no photocopies will be accepted. This offer cannot be applied to previous purchases or combined with any other discount, offer or free gift. It cannot be exchanged or substituted for any other item or cash value. It is not available for purchase. Offer is not valid at LEGOLAND® Parks, LEGOLAND Discovery Centres or LEGO Certified Stores. The LEGO Group reserves the right to cancel or modify this promotion at any time without prior notice. 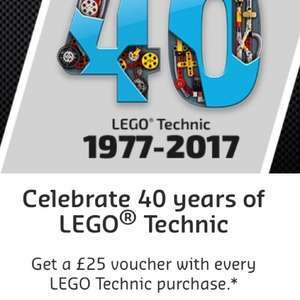 The £25 voucher is awarded for any Technic purchase between the 16th and 23rd. You then have to make a purchase of £99.99 or more to make use of the voucher between 23rd Oct and 23rd Dec.
As others have said Technic is usually to be found much cheaper elsewhere. Often with bigger savings.